← How Can it be Wrong to be Right? What happens when leaders lead badly? The following simple example shows just how impactful small, but singularly inept, leadership acts can be. One of my colleagues holds a senior staff role in an organization that is making a big difference in the health of their community. As a recent hire, her work is to implement their projects, to ensure the organization’s financial viability, and to accelerate their programmatic success. She recently told me about how her supervisors provided her with feedback on her performance. As she described this process, it became clear that their ways of communicating were misguided at best and downright rude and destructive at worst. An accomplished leader in her own right, my colleague was given a one-way evaluation form instead of a two-way performance review. The form had already been filled out (by one person) and it was simply handed to her. The questions on the form were rudimentary and insulting for an executive role. In addition, there were simple numerical ratings with no written clarification of their meaning. Bottom line: this clumsy feedback form left no opportunity for dialogue, mutual understanding, or a shared way forward. Discouraging as this is, what’s worse is that this poor review process had a domino effect on my colleague in her own leadership role. Instead of chalking it up to inappropriate behavior by people who should know better, it upset her enough that she lost her own good sense. She found herself conferring with staff – the people who report to her – about her ratings. She sought their confirmation about whether the numbers were accurate or not. Eventually, she realized that her supervisors’ unfortunate behavior influenced her so much that she herself had gone down a path that made for poor leadership. Upon reflection, she saw that she had succumbed to what I call a “Leadership Seduction.” In this situation, my colleague had fallen prey to the Seduction of: “It’s all about you” – the Sixth Seduction in my new book Leading Valiantly. 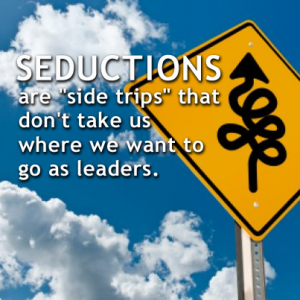 This Seduction is not always about blaming someone else. It can also be about focusing so much on the actions of others that we lose our own way. My colleague had certainly lost her way and, in doing so, she sought validation and vindication from others. But what could her staff say? They were placed in a no-win situation. Besides, what she was really looking for was her own good sense – the wisdom and judgment that she had temporarily suspended when those around her were just plain poor leaders….and when the Sixth Seduction was just too strong to resist. This entry was posted in Blog and tagged Communication, Healthcare, Leader, Leaders, Leadership, Seductions. Bookmark the permalink.